There are a few parts that you see as many (or more) remanufactured options for as new. Camshafts are one of these parts. That’s because camshafts are pretty easy to rebuild, and if done correctly, work just as well. 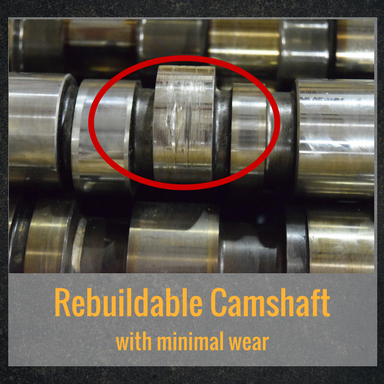 If you are considering replacing your old cam, you should definitely consider going with a remanufactured camshaft. Did you know that as little as .001 of an inch of lobe wear can have as much as a 3 degree effect on your valve timing? While we have another blog that goes into more details about whether or not your cam is ready for replacement, it is always indisputable that you need a new camshaft if your old one fails. The reason for failure will often determine if your old camshaft will be an acceptable core that can get rebuilt. 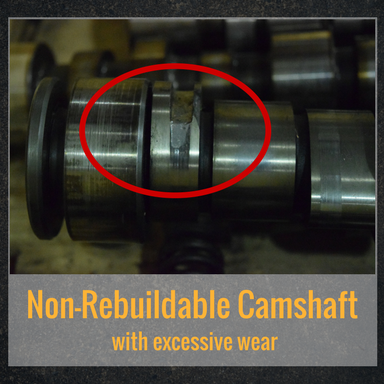 Before a remanufacturer can rebuild a camshaft, they need to ensure that the cam is actually rebuildable. There are a few conditions of the camshaft they need to examine to make this decision. This may seem a little obvious, but the rebuilder will need to make sure the cam is straight, otherwise it will never be rebuildable. With heavy duty cams, this isn’t typically an issue; they’re so durable it would take a lot to bend them. Camshafts can be rebuilt if they have lobe wear, as long as that wear is not excessive. Above you can see examples of both a rebuildable and non-rebuildable camshaft. The rebuildable camshaft has slight wear. You can see that the wear is not deep and just looks like the cam has been scratched. The non-rebuildable camshaft has a complete chunk of metal missing from it, likely the result of extreme mechanical interference. Sometimes the extent to which the lobes can have wear and still be rebuildable is dependent on the specific part number and the engine. Certain camshafts can have more wear than others and be rebuilt, while other camshafts with similar wear cannot be rebuilt. It depends on the engine specifications and the specifications of the camshaft that fits in the engine. Case hardening depth is the harder area of metal on the outside of the camshaft. 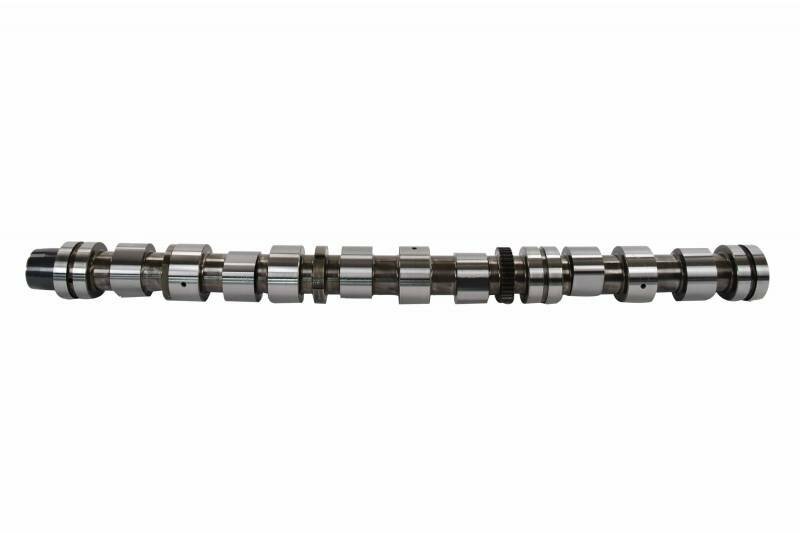 This surface allows the camshaft to endure the constant friction that will be on the lobes, while the soft interior keeps the camshaft from fracturing. When the camshaft is rebuilt, the case hardening depth will be ground into. If there is not enough depth, the camshaft cannot be rebuilt because the softer metal inside the cam wouldn’t be hard enough to bear the friction of the rollers. Determining the case hardening depth isn't something that can be done by eye alone. It requires special equipment in a machine shop to determine if the depth is acceptable for rebuilding. To learn more about rebuild requirements for a camshaft and how to tell if yours will be accepted as a core, read our past blog, How Do I Know If My Camshaft is a Good Core? After the rebuilder has determined that the camshaft can be safely rebuilt, they need to actually do the remanufacturing. To remanufacture a camshaft, there are two major processes the rebuilder can do: welding and regrinding. Welding is only part of the remanufacturing process when there is so much wear that the camshaft can’t be only be ground and meet specifications. When a remanufacturer welds a camshaft in the rebuild process, they are adding more material to the camshaft to fill in the areas of wear. After building up material, they will grind it down so it meets proper specifications. The material used to build up a camshaft during this process is usually harder than the material the camshaft is made of, so there shouldn’t be any fear of the rebuild not holding up. Regrinding is always a part of the remanufacturing process. If the wear on a camshaft is minimal, the rebuilder may only have to regrind the cam to finish remanufacturing it. A remanufacturer will use a CNC grinder to grind down the lobes of the camshaft to ensure they provide the proper lift that is required for the engine. There are two basic parts to a lobe: the base circle and the lift. When a lobe is worn, it is usually worn on the lift. To restore the lift, the area of wear must be ground down so that it is smooth again, and the rest of the lobe must also be ground so that the lift from the base circle is the same that it was prior to wear. Our remanufactured camshafts are rebuilt to OEM specifications, so you don't have to worry about the camshaft functioning poorly. They're refurbished to run like new. If you're concerned about a loss of power in your engine, check out your camshaft—it might be time to update! And be sure not to instantly rule out remanned options when you do. You just might save yourself some money on a great part! Still undecided or need more information? Our certified techs can answer your camshaft questions! Give 'em a call at 844-215-3406 to see how HHP can help you. You can also always request a quote online for any of your diesel part needs.